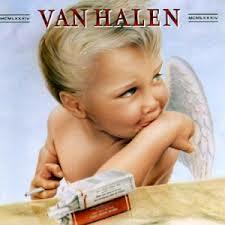 1984 by Van Halen was the first album (tape) I ever bought with my own money. I was 11 years old, and I don’t remember how I got the money (by honest means, I assure you), but I knew that was what I wanted. I was raised on rock music. I remember as a kid listening to 94.7 KMET out of L.A. It wasn’t called classic rock yet, because the music wasn’t that old; the oldest stuff they played was from the late ’60’s. Zeppelin, Pink Floyd, The Stones, Jimi, all that stuff. Then 1984 came out. It got heavy airplay, and I just loved it. Panama, Jump, and my favorite, Hot For Teacher. I bought that tape and damn near wore it out. By 1986, two things happened: My family moved to a new town, where I realized that as the dorky new kid I was not instantly popular, and Van Halen made a video for Hot For Teacher. If you haven’t seen it, I’m not going to go into much detail about most of it. Van Halen, girls, yadda yadda. What caused me so much grief was the little intro to the video. The intro featured a young man, appropriately named “Waldo”, being groomed by his mother for his first day at a new school. He’s worried about being picked on by the other kids, but mother assures him everything will be fine. The bus comes to pick him up, with kids on it being loud and throwing paper airplanes. The doors to the bus open, and David Lee Roth is the bus driver. Waldo is terrified to get on the bus, but steps on. The video continues, showing how mortified poor Waldo is at his wild, raucous new school. Surely you can see where this is headed. For a while it expanded to the hallways and the classroom, but it died down soon enough. I’d like to make it clear I’m not looking for any sympathy here. Bullying is a huge issue, and kids are (and were back then) bullied way worse than me. Fact is, a little name-calling aside, my life was pretty great. And by high school things went back to normal, and I wasn’t the new kid anymore. I just couldn’t get over the irony that a band I absolutely loved was causing me so much grief. 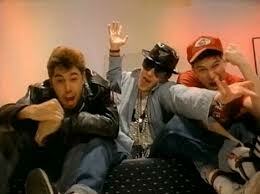 Now that I think about it, the second album I ever bought with my own money was Licensed To Ill by the Beastie Boys. Their video for (You Gotta)Fight For Your Right (To Party) had nerds in it, too, but I never had any crazy guys showing up at my house to party with beer and hot chicks. What a gyp. This entry was posted in Music, Other and tagged A-Z Challenge, Beastie Boys, David Lee Roth, guitar, Hot For Teacher, music, rock, Van Halen. Bookmark the permalink. Van Halen with David Lee Roth ROCKED! I remember the hot for teacher video….I actually like their debut album and women and children first a little better than 1984….Started losing interest when Sammy joined them. Good Blog! I got to see them live once, but it was the Sammy years, so it was kind of bittersweet. As a guitarist it was still worth it, though, for Eddie’s guitar solo. Thanks for reading! I was bullied horrifically through my school years. By the time I got into high school, I was pretty pissed off and I had a tendency to throw punches at my detractors, so It slowed down a little, at least to my face. I’d always get wind of the stupid rumors being spread behind my back. In legend, I really was much more of a badass than I ever could be in real life. However, the truth was I was a very unhappy person with an undiagnosed mental illness, trying to figure out what the hell was wrong with me and why everyone hated me so much. Funny story about Van Halen. One time this gal was giving me a ride home and the subject of Van Halen came up. She said that listening to them caused people to become devil worshipers. I thought she was kidding, so I laughed. I said, that’s a devil I could really get into worshiping. They rock! She wasn’t kidding. She never gave me a ride home again. That’s okay–I’d rather have listened to Van Halen anyhow. People like that have always cracked me up. Once at the Whisky in Hollywood, I was “interviewed” for an online magazine about rumors of this band I was there to see being Satanists. I proceeded to tell her the rumors were true and that the band sacrificed goats, among other things. In the end, I think the girl was sorry she asked.